THANKSGIVING SKIES: Thanksgiving is the biggest travel holiday of the year in the United States. Millions of people board airplanes and fly long hours to visit friends and family. Dreading the trip? Think of it as a sky watching opportunity. There are some things you can see only through the window of an airplane: full story. 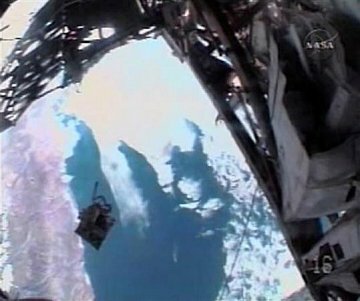 Above: NASA TV footage of the runaway toolbag. After sunset on Nov. 22nd, Edward Light saw the bag using 10x50 binoculars as it sailed over his backyard in Lakewood, New Jersey. "It was quite a favorable 70-deg pass in clear skies," he says. "The visual magnitude of the bag was about +6.4 plus or minus half a magnitude." On the same night, Keven Fetter of Brockville, Ontario, video-recorded the bag zipping past the 4th-magnitude star eta Pisces: 900 kB movie. "It was easily 8th magnitude or brighter," says Fetter. This week the toolbag is making a series of passes over Europe; late next week it will return to the evening skies of North America. Using binoculars, look for it flying a few minutes ahead of the ISS. Spaceweather's satellite tracker is monitoring both the space station and the tool bag; click here for predictions. "Venus and Jupiter were shining threough a gap in the clouds last night when a pair of Iridium satellites passed overhead," says Mark Staples of Waldo, Florida. Sunlight glinted off the satellites' flat antennas, producing two supernova-like flares "within 20seconds and 1o of each other. The brighter flare was already half-finished when I started the exposure." Double Iridium flares are uncommon. 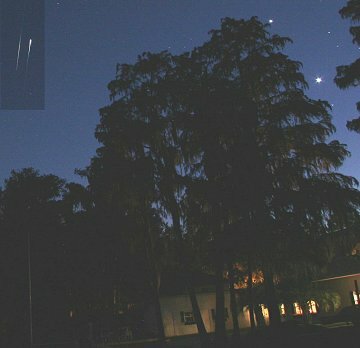 There are 66 active Iridium satellites orbiting Earth, but they don't often cross paths at the exact moment of a flare. In this case, an on-orbit spare in a lower orbit lapped a higher, primary Iridium satellite; they met in sunlight and oh-so-briefly stole the show from Venus and Jupiter. Readers, keep an eye on the sunset sky tonight. Venus and Jupiter are still there, rapidly converging for a spectacular conjunction with the Moon at the end of the month. It's a lovely show--no Iridium required. Sky maps: Nov. 26, 27, 28, 29, 30, Dec 1. On November 26, 2008 there were 1001 potentially hazardous asteroids.